47347 has just emerged from the tunnel into daylight at Blaenau on June 27th 1993. 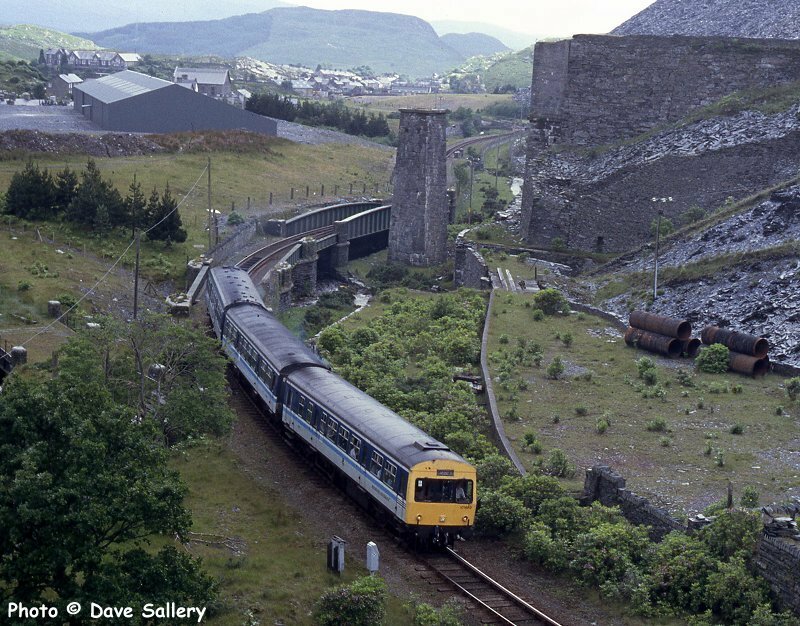 There were two private sidings at the tunnel entrance, on the left serving Oakeley Slate Quarry and on the right Llechwedd. As shunting them required the locomotive to remain in the tunnel for a lot of the time it was not a popular duty! The famous Slate Caverns tourist attraction is located higher up on the right hand side. 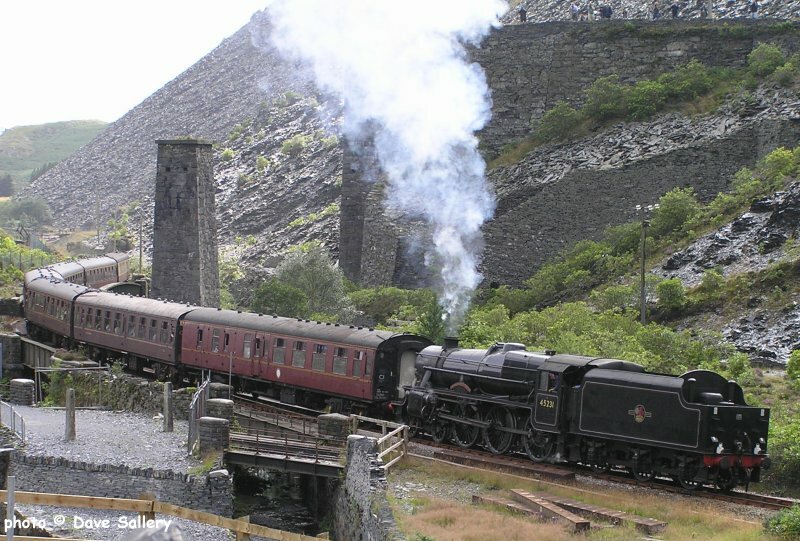 The Ffestiniog Railway had a branch to Llechwedd which passed under the standard gauge line here and accessed the quarry by an incline behind the building. Recent road improvements have reshaped the area around here. 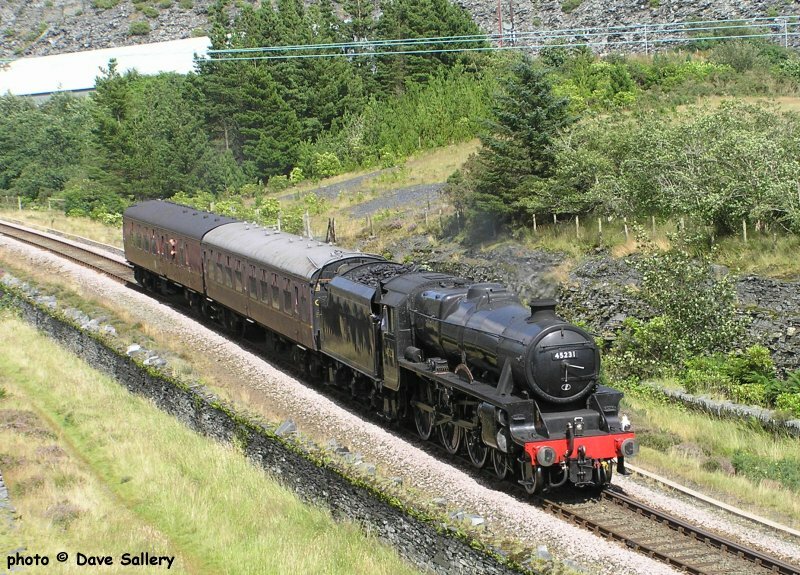 45231 approaches Blaenau tunnel with its seven coach train, 5th August 2009. The stretch of track up to the tunnel entrance is the steepest on the entire line, 1 in 43/2.3%. 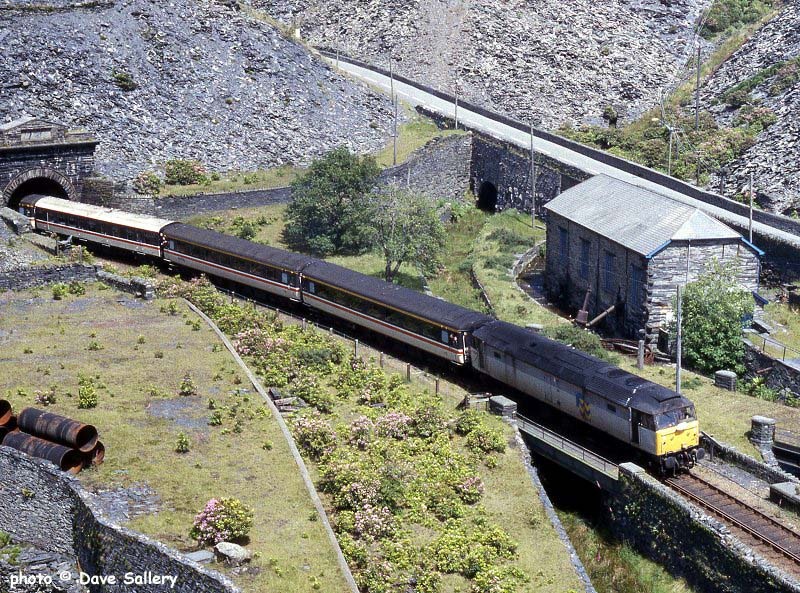 101683 about to enter Blaenau tunnel on 9th July 1994. In the background are the remains of the abutments of Glan y Don viaduct. This was a spindly wood and steel structure which gave access to a large waste tip, now removed, on the left. 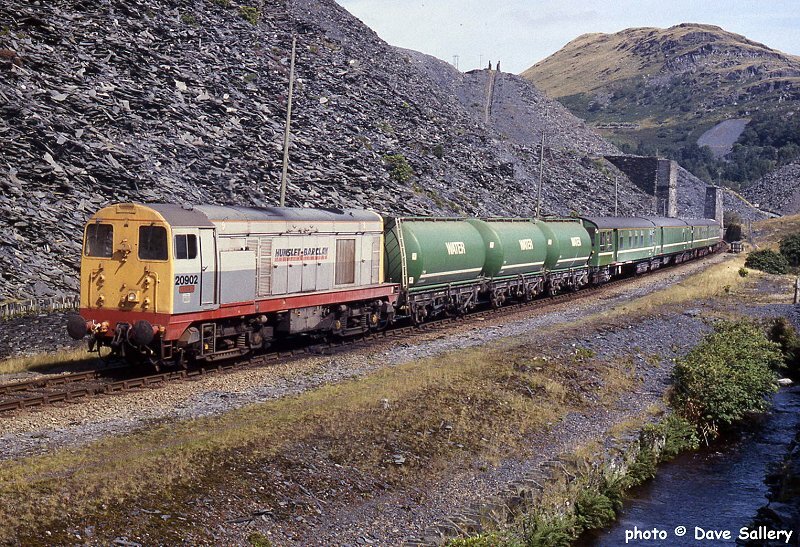 20902 and 903 alongside the Afon Barlwyd with the weedkilling train, 17th August 1993. 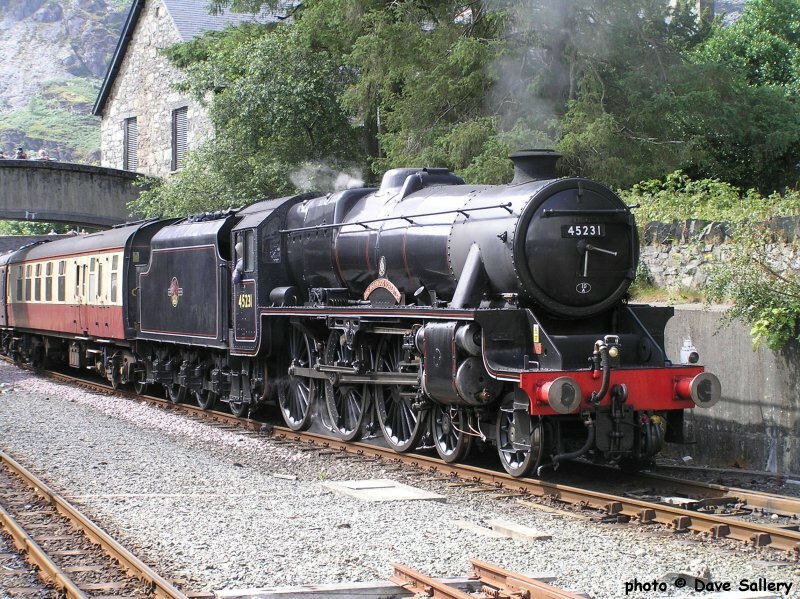 45231, with the two carriages which had been left in Betws y Coed, nears Blaenau, 5th August 2009. 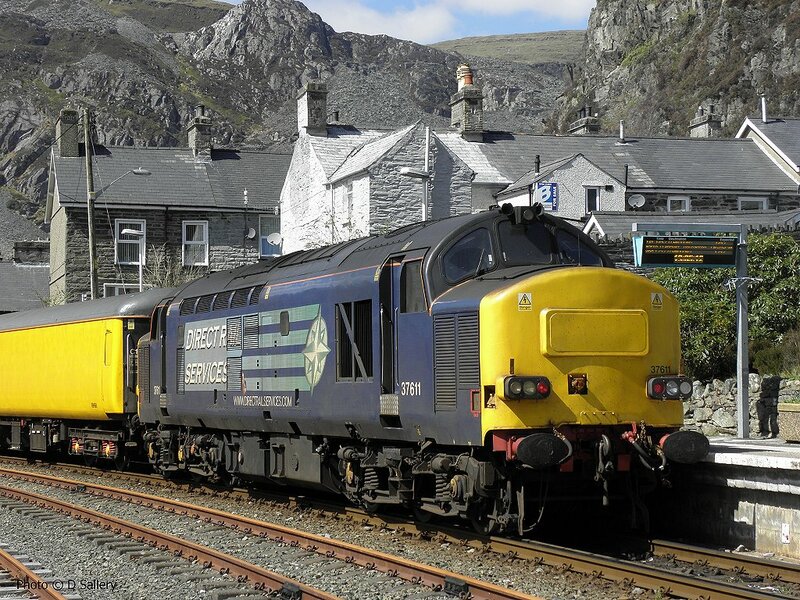 101685 and 680 on a well loaded service from Llandudno in May 2001. 47773 on a Tyseley to Blaenau charter train. The trackbed on the left was formerly the Ffestiniog Railway's Dinas branch. 18 August 2012. 67019 crosses the bridge over the Afon Barlwyd on June 28th 2005. 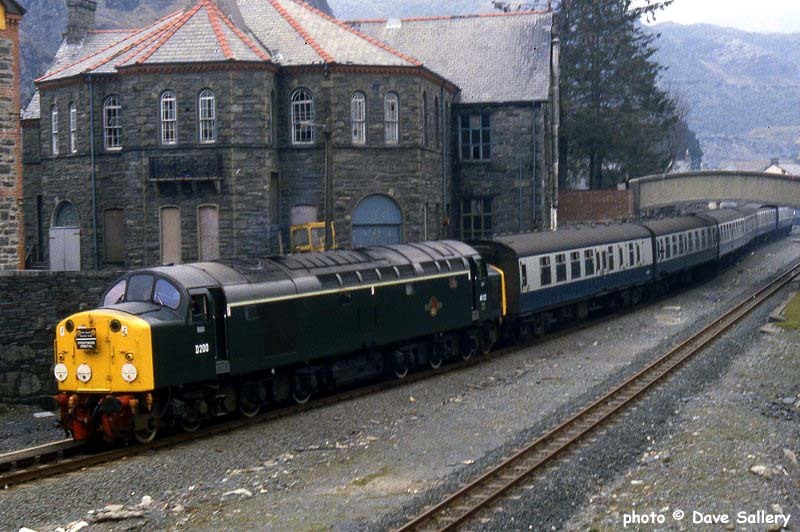 Newly restored to green livery, 101685 is viewed passing the disused platforms of Blaenau Ffestiniog North station on 14th June 1994. This former L.N.W.R. station was closed in 1982 when the new Central station opened. The area on the right was once a large transhipment yard for slate with both standard and narrow gauge tracks. In the background are the waste tips of Oakeley Quarry, at one time the largest underground slate mine in the world. The zigzag path marks the route once taken by the quarry workers and the now trackless incline to its left led to the Ffestiniog Railway. The pioneer Class 40 No. 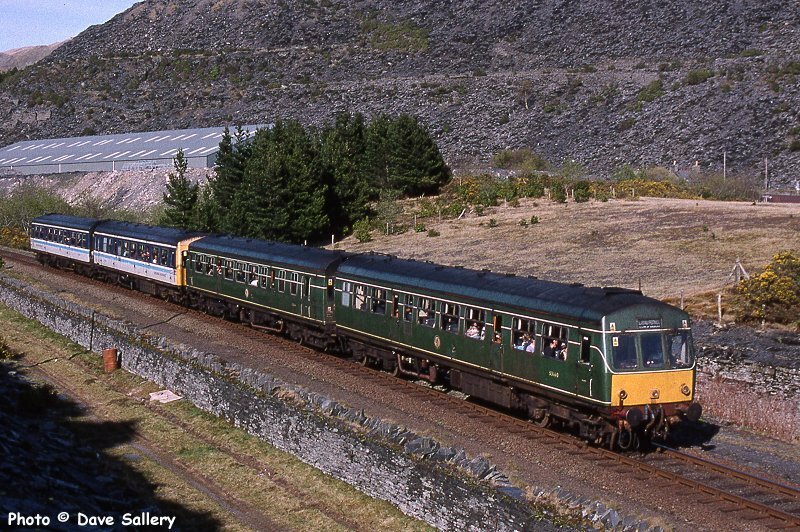 D200 brings the stock of its excursion out of the loop ready to back it into the station on April 14th 1984. This loco is now preserved as part of the National Collection. The Ffestiniog Railway to Porthmadog is seen on the right. 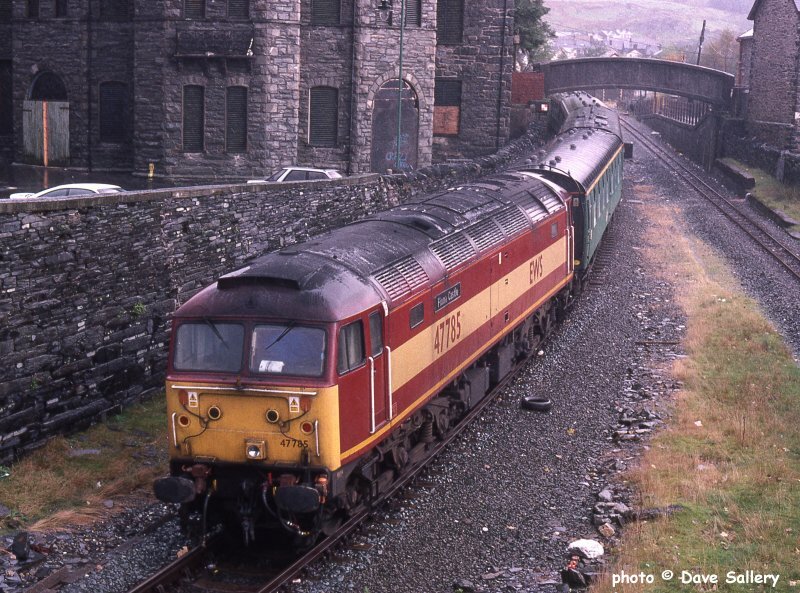 47785 'Fiona Castle' on the rear of the 'Trawsfynydd Lament', October 17th 1998. 45231 shunts its stock, 5th August 2009. 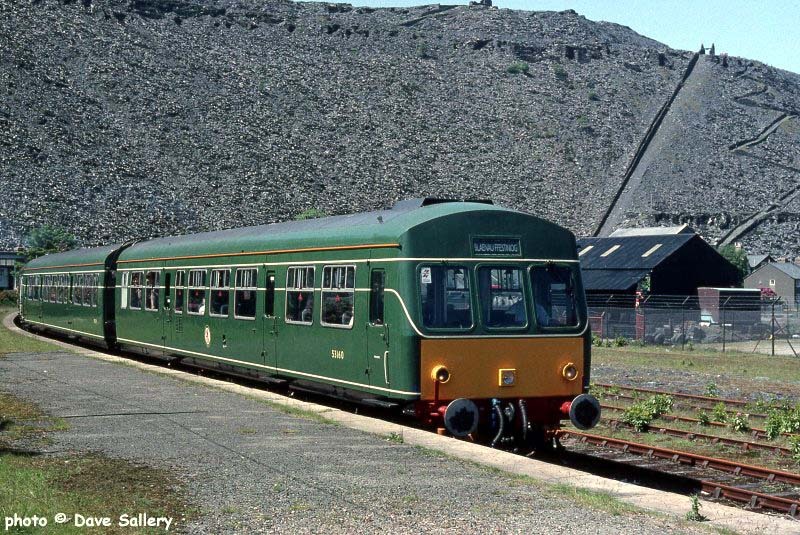 Two class 108 units wait at Blaenau while working a "Sunday Shuttle" service on 25th August 1991. 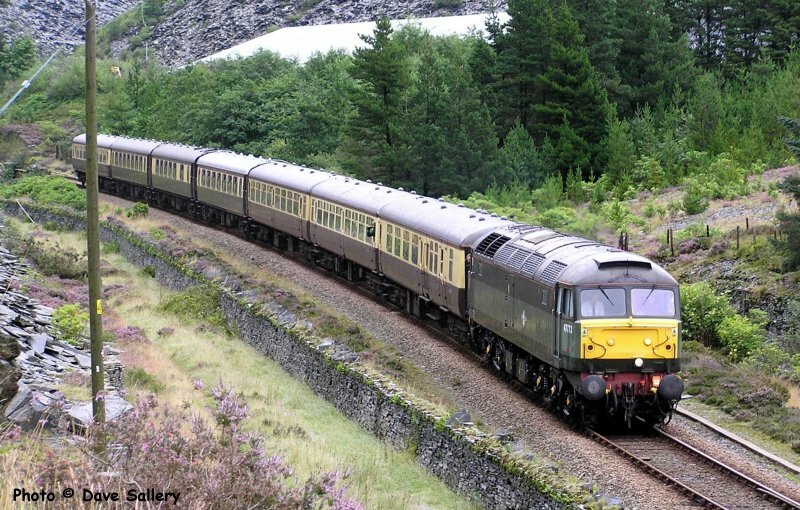 At that time a Sunday service was only provided on the six peak Sundays of the year but nowadays a Sunday service is provided throughout the Summer timetable period. 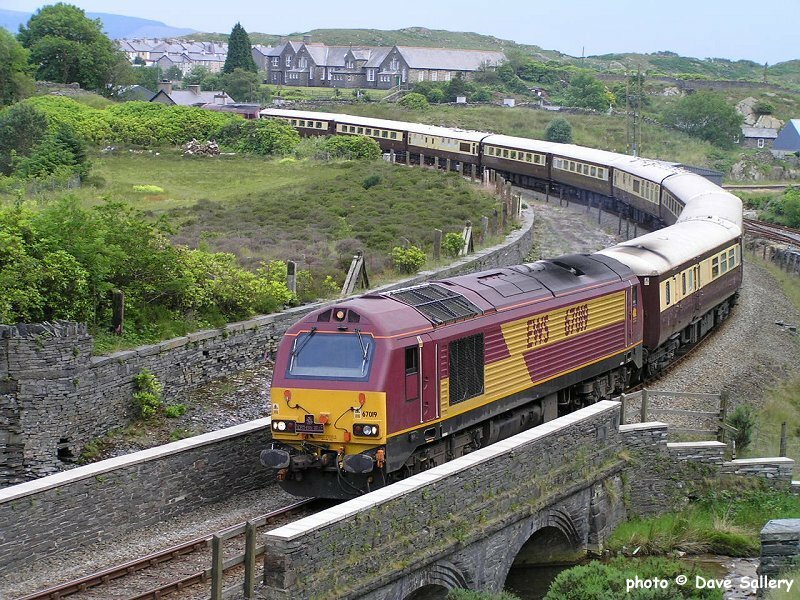 The North Wales Railway Circle always had a close involvement in the running of this service and this arrangement continued until quite recently. 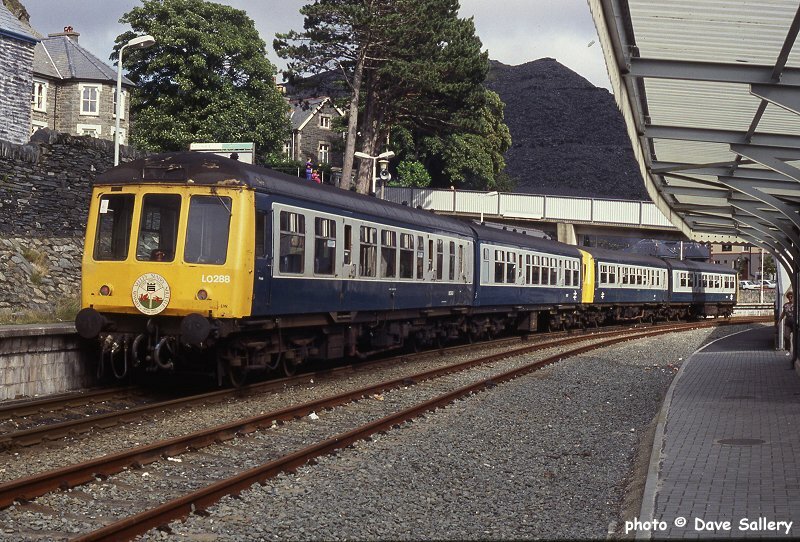 The headboard came in English and Welsh versions with the Welsh one always leading up the valley. Nowadays a headboard is no longer carried. 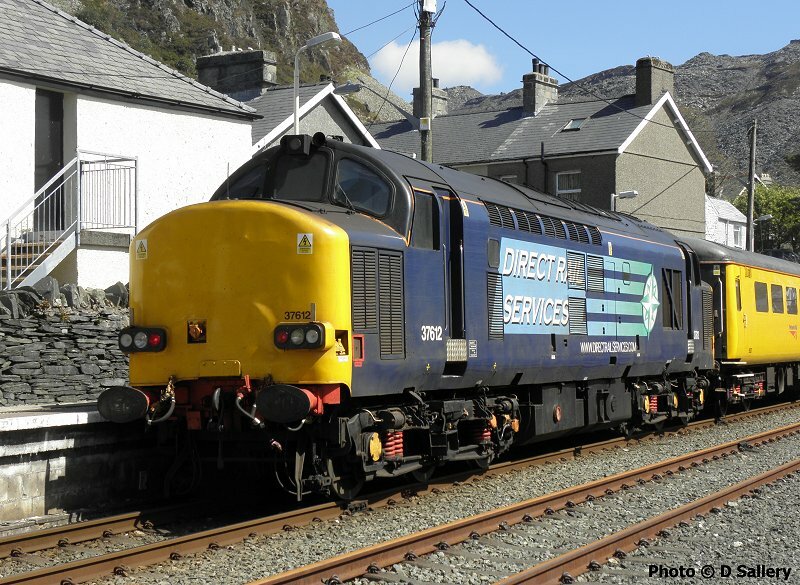 37611 and 612 visited Blaenau on 18 April 2014 on a Network Rail inspection train.